I don’t know about you but our bedroom (and even the spare room) becomes a haven for collecting “stuff”. I mean it is usually a secluded part of the house and is unseen by guests unless of course they are overnight guests. LOL. I have found when our bedroom is organized it makes a HUGE impact on my life – I don’t have as much brain fog and I see to be more focused. The bedroom is the foundation of where you begin every day, an organized bedroom helps you wake up with the mindset to conquer the day’s challenges and enable you to get each day started on the right foot. Give away or toss what you don’t use. Sort out off-season clothes for separate storage. Move non-bedroom items out and store them in other parts of the house. Make your bed daily – it’s a quick and easy way to declutter the look of your room. Once you’ve cleaned out some of the clutter, you will have a better idea of what you need to store what’s left. To save money, you want to find ways to use your current storage as efficiently as possible and invest in items which will help round out your bedroom set and expand your storage space. Drawer organizers – socks and underwear drawers are usually the messiest, right? I toss mine in baskets to make it easy. How about organizing your drawers with drawer dividers or honeycomb-style organizers to keep things moving on busy mornings. You can pick some of these up in the dollar store. Closet systems – We have two SMALL bedroom closets. So for mine, we added an extra rack which helps to keep my clothes organized with long items on one side of the closet shirts and tops are on also on the top rack with pants on the bottom row. I put the things don’t use often on the top shelf in a Thirty One Your Way Cube. The clear window lets me see what is in there in case I forget! I store off-season clothing and extra linens in Thirty One’s large utility totes with lids. Shoe rack, shoe tree or shoe ladder – keep your shoes in their best shape and easy to find with a shoe organizer. Double the space at the bottom of your closet with a couple of shoe shelves. Look at your bedroom pieces and add missing items which offer extra storage including a dresser stack, nightstands, chest of drawer, storage bed, storage bench and media stand. Storage beds and headboards – bed frames can boast the bed to product under-bed storage making the most of unused space. It is also a great place to store extra linens and off-season clothing. Headboards with built in bookshelves and compartments offer valuable space to keep books, clocks and bedside necessities handy and organized. Swap out your night table for something bigger – night tables keep a few things handy, but they don’t help you stay organized. Choose a two drawer nightstand instead or if you need more storage space, upgrade to a small dresser. Dresser stack – add a couple of extra storage drawers with a dresser stack, attaching to the top of a matching dresser many offer a contemporary asymmetric look. Bedroom chest – a chest, chest of drawers, bureau or gentleman’s chest typically have a profile that is taller and more narrow than a dresser. This is great if you are tight on floor space because it increases storage space with a vertical stance. 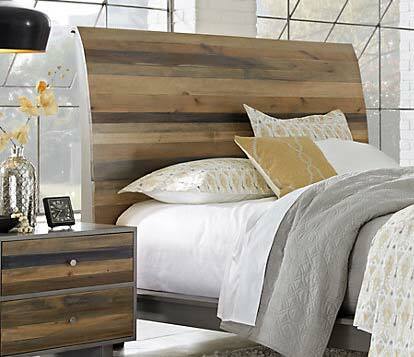 Look for extra pieces that might not be part typical bedroom sets to add extra storage and utility to your room. When shopping for these pieces you can choose to match similar wood tones to the furnishings you have already or choose contrasting finishes to create an accent in your room. Bookshelves – are not just for living rooms and home offices, bookcases can help you keep things organized, utilize baskets and boxes on lower shelves to conceal clutter. I have one in our bedroom. Storage bench – placed at the foot of your bed (ours is off to the side), offers the perfect place to keep throw pillows and extra blankets handy while doubling as a handy spot sit when you lace up your shoes. Hall tree – the one in our bedroom was made by my grandfather MANY years ago. It is place to hang tomorrow’s outfit or keep last minute wardrobe changes off of the floor. Today’s tips are courtesy of Furniture.com.. be sure to check out their bedroom sets and other home furnishings at a store near you. I did not receive any compensation for sharing their information in this blog post.